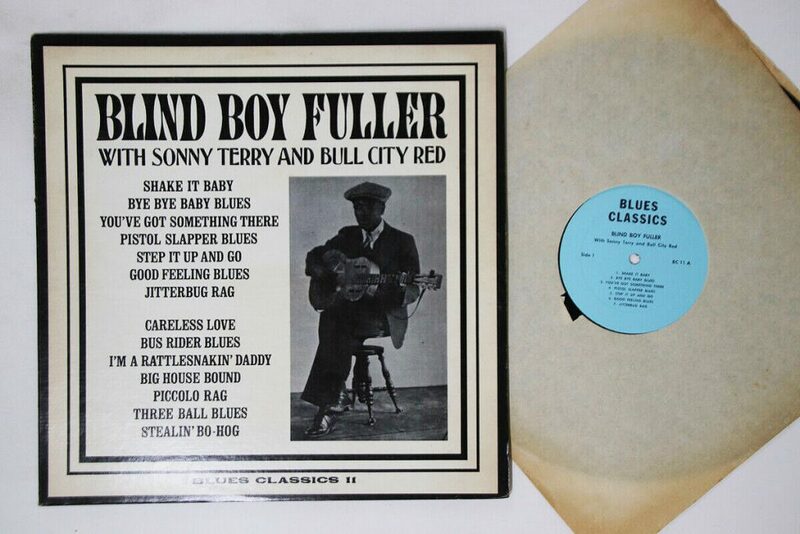 Check out these new and used Blind Boy Fuller vinyl records LPs for sale. Blind Boy Fuller was born in North Carolina around 1904. As a child, he learned guitar from the older singers that lived in his rural area. He started to lose his vision as a teenager, which had originally been attributed to ulcers, but later it was revealed the source of his blindness was untreated neonatal conjunctivitis. He was completely blind by 1928 and started playing in the streets to earn any money he could scrape up. A record store manager was able to get him a recording session with the American Recording Company in 1935, and this led to a career eventually working with several labels. Blind Boy Fuller’s singing is characterized as rough and straightforward, and his lyrics are often explicit, drawing from his troubled life as a blind musician trying to earn money on the street. He became known for Hokum songs such as I Want Some of Your Pie and Get Your Ya Yas Out. Fuller died in 1941 from infection, and his protégé Brownie McGhee recorded a tribute song The Death of Blind Boy Fuller for Okeh Records. We recommend starting your vinyl collection with his Greatest Hits 1935-1938. Our inventory is constantly changing, so check back later, or browse our list of vinyl from blues musicians.